Is your KitchenAid Blender Gasket, shredded, torn, worn or missing? 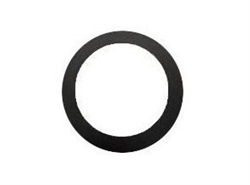 You may need a new KitchenAid Blender gasket 9704204. This blender part mounts between the blade assembly and jar to create a water-tight seal. This rubber gasket fits many older KitchenAid Blenders and restores leak-free blending performance to your blender. A torn blender gasket is not difficult to replace, and is a cost-effective way to get your blender blending again. This original Kitchen Aid blender part insures top-quality performance.